“Special Time” is one of the listening tools that I teach to parents. I have used it myself as a parent for over 15 years, and it has been a gift to everyone in our family. It helps us recover from our rough patches and makes the good times even sweeter. So, in the spirit of giving to and supporting families, I would like to share the tool of Special Time with you and your family! To begin Special Time, tell your child that you are going to spend a certain amount of time doing what they want to do. It can be 5 minutes or 30 minutes or an hour…the amount of time is less important than you being able to give your full attention. Then, set a timer, and follow their lead! Enjoy giving yourself permission to take a break from the dishes, phone calls, emails, and other demands, and focus all of your attention on your child for that time. Resist the urge to teach or to direct the play and allow your child to show you how they want to play. If you are doing a puzzle, this is not the time to teach them how to turn all the pieces over the right way, or to make them begin with the outside edges. Usually, children jump right into Special Time with enthusiasm. They will show us what they love, what they are thinking about, perhaps show us in their play something that has been bothering them. They may want us to pay attention while they do something we don’t really like (screen time or a messy activity are common examples). Trust me, you will be making great inroads in your connection with your child if you can set aside your misgivings and just enjoy that activity with them as best you can. However, if your child doesn’t offer any ideas, don’t jump in with suggestions. You can say “I’ll just be here with you while you think about it.” Once they can really tell that they have your attention they will probably find a way to use it. The logistics of Special Time may be challenging with multiple children, but it is possible to manage this one-on-one time with even a large family. It may mean enlisting the help of friends, your partner or other family members so that all of the children are cared for while you spend a little time focusing on just one child. Sometimes parents find that they can take advantage of their children’s varying schedules to set up some one-on-one time. These moments, when your children have your undivided attention and can feel your delight in them, is what they want most in their heart of hearts. Even a few minutes of Special Time can refill your child’s “attention tank.” It doesn’t take long for most children to catch on and begin requesting special time! This is a gift that you give to them all year long! 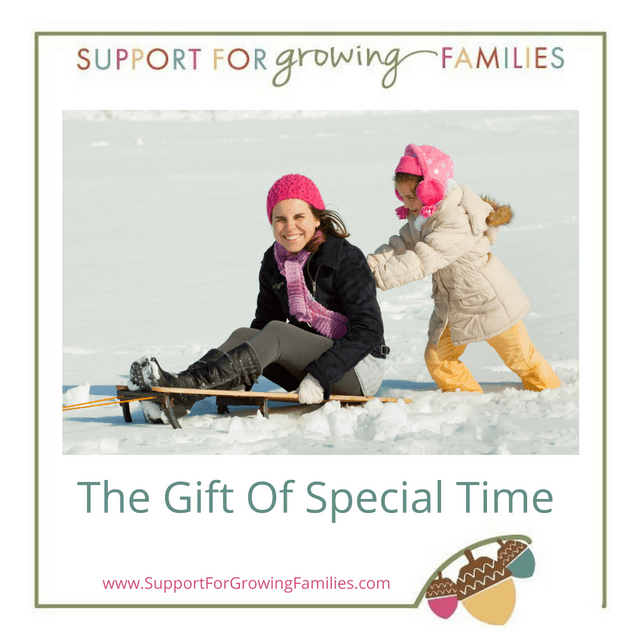 Special Time helps to deepen and strengthen children’s sense of connection with you. Also, in terms of your day-to-day survival, it can help children to manage transitions, reduce sibling rivalry or prepare children for the arrival of a new sibling. To hear more about how special time can help with common parenting challenges check out the many free articles and stories on the website at Hand In Hand Parenting. As December progresses, with its many demands on all of us, whether or not we celebrate Christmas, Special Time may be just the gift to help your family slow down and really connect with each other. Give it a try, and let me know how it goes!